Father McShane greets the new cohort of Jesuit scholastics at Cunniffe House. Each year, several Jesuit scholastics arrive on campus to begin the academic phase of their journey to become a Jesuit priest or brother. 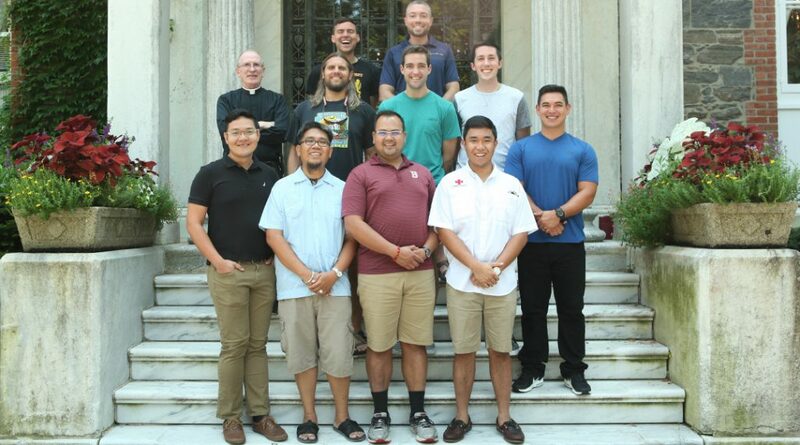 Jesuits begin that journey as novices, where they focus on spirituality, study the Jesuit Constitutions, and work with community—to name but a few of their responsibilities. 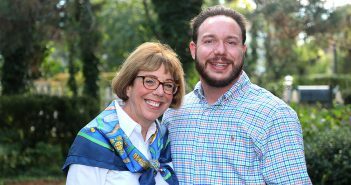 On completion, they take their first vows and begin their scholastic stage, which is when they arrive here at Fordham, said Brendan Coffey, S.J., a scholastic in his second year of study. 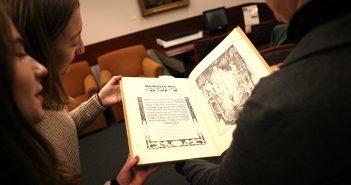 They arrive at Fordham having completed a bachelor’s and are seeking to complete their master’s degree. Last week, Coffey led 10 new scholastics on a tour of the Rose Hill campus, which included a welcome from Joseph M. McShane, S.J., president of Fordham. As he has with many a new student, Father McShane advised the new Jesuits to “major in New York City” regardless of their area of interest. Coffey graduated from Fordham College at Rose Hill in 2008, where he majored in philosophy, which is what most of the newly arrived scholastics will study during their time here. Since he completed the required coursework in philosophy during his bachelor’s studies, he is getting his master’s in theology. This year’s group hails from Denver; Sacramento, California; Tampa, Florida; and several other cities across the nation, he said. They are living across Fordham Road in a residence on Belmont Avenue. Everyone in this year’s cohort is enrolled in the master’s in philosophical resources, which is open to any student, but is designed specifically for the Jesuits. Coffey said that he got to know a few of the scholastics during his undergrad years at Fordham. It helped shaped his perception of the community and solidified his calling. “I love New York and I wanted to have these guys feel connected, welcomed, and to own the mission of the university,” he said. In addition to welcoming the scholastics and helping them become acquainted with Fordham, Coffey said he and his scholastic colleagues want to make their fellow Rams aware of their presence on campus and their efforts off campus in Bronx.